Large conflagrations like the Yellowstone fires of 1988 have spurred policies emphasizing the removal of fuels to reduce risk, but a new study suggests severe fires are not a historic anomaly. Photo courtesy of Harlan Kredit/NPS. Severe fire may historically have been more common in the dry forests of the West than previously thought, casting doubt on federal policies that emphasize fuel reduction to lessen the risk of such fires, according to a new study from two researchers at the University of Wyoming. But other experts in fire ecology and forest science question the novel findings, which they say are based on faulty assumptions. The prevailing wisdom among fire ecologists, based largely on research using tree rings and fire scars to determine historical fire severity in dry forests, suggests that those forests burned lightly at regular intervals but that high-intensity fires -- the kind that reach the treetops and kill entire trees -- were rare. 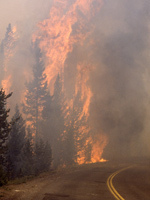 That understanding has led Forest Service officials to adopt policies emphasizing forest thinning and controlled burning to try to reduce the risk of high-severity fires. Legal battle over logging in woodpecker habitat takes wing in Miss.